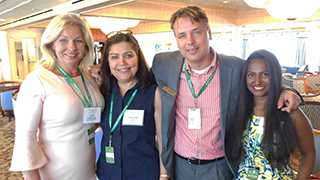 Lori Copeland, Director, Merit Travel Group, Helena Dias, Supervisor, Exclusive Tours, Hans Lagerweij, CEO, Victory Cruise Line, and Cristabel Sundram, Sales Support, Exclusive Tours. A comfortable stateroom on the Victory I.
Toronto skyline view from the Victory I. The Cliff Rock Bar & Grille, where guests do some of their own cooking on hot stones. When you’re focused on the outbound travel business, you sometimes miss the good things going on in your own backyard. That’s why it was such a pleasure to visit the Victory I cruise ship in the Port of Toronto last week. I have to admit I had no idea there was a vessel and cruise experience of such quality cruising around our beloved Great Lakes. 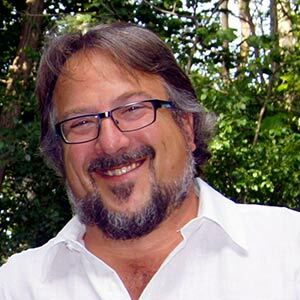 Miami-based Victory Cruise Lines launched in July 2016, the brainchild of cruise industry veteran Bruce Nierenberg. His target was a cruise-experienced older crowd that still wanted to hit the water, but in a more intimate setting. The line’s first ship Victory I is definitely intimate. The former Saint Laurent was built in 2001 and previously operated by the Haimark Line. It carries a maximum of 202 pax – more often around 170, company officials say – and a crew of 82. The line recently acquired, refurbished and launched a second, nearly-identical sister ship. Victory II set out on its first cruise from Boston on 20MAY. 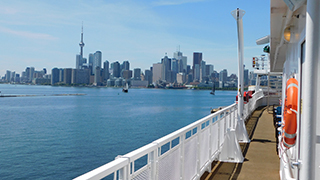 During a port call in Toronto, Victory management invited agents and media aboard, with the main purpose of introducing Merit Travel’s Exclusive Tours as its new Canadian sales representative. Lori Copeland, Director Product Development and Cruise Programming for Merit was on hand along with other members of her team. Of course, on an 87-metre, 4,954 gross tonne ship, you can’t expect all the bells and whistles of the behemoths from mass market lines. But the space Victory I provides is really nice, elegantly appointed without being stuffy. The crew, as experienced during a presentation and three-course lunch, is warm, welcoming and practiced. The meal produced in the ship’s galley was of a very high quality. Victory I has two 335-square foot suites, but most staterooms (all of them outside) are between 146 and 190 square feet. They don’t feel small, though, and are bright with décor and natural light. 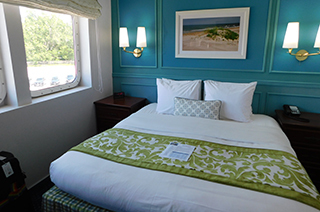 There aren’t balconies like those on newer, larger ships, but there are large picture windows and on a vessel of this size, the outdoors is never far away. Victory offers a premium, all-inclusive cruise experience. 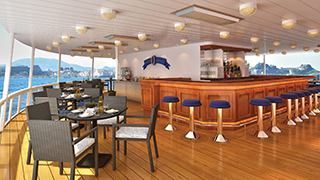 Beer, wine and spirits flow freely throughout the cruise, though the patrons are unlikely to be lager louts. WiFi and on-demand movies are included, and for your clients’ dining and drinking pleasure there’s the main Shearwater Dining Room, the Cliff Rock Bar & Grille featuring hot-stone cooking, the Seascape Tavern and the Compass Lounge. “The ship experience is built around people who like a good book, a good talk and a drink at the bar,” says Hans Lagerweij, the youthful Victory Cruise Lines CEO. Lagerweij told visitors that Toronto is a favourite city, from the four years he spent living there as President & CEO of Quark Expeditions. He says that while Victory delivers a very comfortable and pleasant onboard experience, the real focus is on learning about and exploring destinations. That’s accomplished with onboard specialists, including historians and naturalists, and a full program of shore experiences – again, all included in the fare. “We only offer the exciting tours,” says Lagerweij. “We don’t offer a standard walking tour and then try to upsell the guests. There’s a strong focus on local ingredients and local food experiences too, both on and off the ship. The small size of the Victory ships enables them to offer intensive coastal cruising in areas including the Great Lakes, Canada/St. Lawrence and New England during the warmer months, then visit Cuba and Mexico in winter. The warm-weather itineraries are fascinating – a land/cruise tour of Mexico’s Yucatan Peninsula with visits to all three states, and a full Miami-roundtrip 14-day circumnavigation of Cuba with a diverse list of shore experiences.